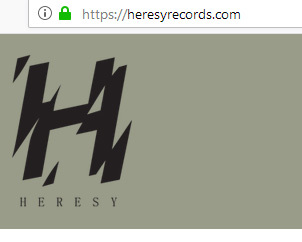 Your privacy is important to us – Heresy Records will never share your personal information with other parties. We never keep any payment details on record. All information regarding your online transactions and identity is kept confidential through our payment gateway Stripe. You can access all your personally identifiable information that we collect online and maintain by emailing info@heresyrecords.com. To protect your privacy and security, we will take reasonable steps to verify your identity before granting access or making corrections. We use this procedure to better safeguard your information. You can correct factual errors in your personally identifiable information by sending us a request that credibly shows error. Should you have other questions or concerns about our privacy policies, please send us an e-mail at info@heresyrecords.com.